The beautiful island of Ibiza is known worldwide for its vibrant music scene, late-night parties, and celeb-studded yachts, but we know that our beloved island is also a haven for families, the perfect place to spend relaxed time together. One of the joy of being on holiday in Ibiza is to spend lazy days at the beach with the whole family. Even if the island boasts more than 53 beaches, not all of them are suitable enough for younger kids – this is why we’ve put together a list of the most family-friendly beaches featuring spacious sandy beaches, gentle slopes into the sea and crystal clear shallow waters. But Ibiza offers also plenty of other kid-friendly activities where every member of the family will find something to enjoy. If you are driving towards San Antonio, consider planning a pit-stop at the aquarium of Cap Blanc. This aquarium might not win a prize as the most beautiful aquarium in the world, but it sits in a beautiful natural cave, which makes the visit extra magical. If you fancy an active holiday with the family then, depending on the age of your kids, you can either rent a bike and enjoy cycling along the coast, horse riding in nature or walking the many beautiful corners of the island. There is more than beaches and outdoor activities in Ibiza, the Hippy markets are the perfect way to truly experience the vibrant and laid back vibe of the White Isle. Among colourful stalls selling everything from clothing, jewellery and trinkets, children will be delighted while you will have time to indulge yourself in some shopping. Music and good food is just the icing on the cake. The Hippy Market of Punta Arabi offers also a kids area, where the little ones can create their own crown-flowers, get a fantasy face-painting or join creative workshops. When it comes to restaurants Ibiza has become renowned for having the best in style and flavours. Whether it’s a beachside lunch or a laid-back dining in the campo, the whole family will be spoilt for choice! If you are looking for places where kids can run free & have fun while you are enjoying a tasty meal we will suggest La Paloma in the north of the island. If you fancy dining with your feet in the sand than Tanit Beach Club is the right choice, they offer kids’ menu and provide a kids club with plenty of activities to entertain the little ones. Ibiza is well-known all over the world for its turquoise sea and beautiful beaches. It boasts more than 53 beaches, so there’s plenty of choices – from long stretches of sand and intimate bays to secluded coves and rocky inlets. If you are coming on holiday with your kids, you might want to consider spending your day relaxing on the most child-friendly ones. For as beautiful as they are, not all of them are suitable enough for younger kids – some beaches may lack of amenities and others may not be safe, featuring difficult access to the sea and steep cliffs. To help you find the perfect spot to unwind and enjoy a day with the whole family, we’ve rounded up 10 of Ibiza’s top family-friendly beaches – all boasting clear waters, beautiful views, activities for all ages and tons of opportunities to keep everyone happy. Located in the far north, Portinax is very popular among families with a bit of something for everyone – plenty of space for the youngest ones to play, wonderful turquoise sea with shallow waters and a gentle slope into the sea. The bay is surrounded by pine trees, which provide some shade and resort-style hotels and eateries where you can enjoy delicious meals, overlooking the beautiful turquoise sea. Another great beach in the north of the island is Cala San Vicent. It’s a spacious sandy beach, surrounded by a long pedestrian promenade with some beachside cafes and restaurants, where you can enjoy a delicious meal while overlooking the beautiful sea. A must-do when you are here is to take your car and go up to the top of the cliff to witness the breathtaking views of the beach below – and take a beautiful family picture with this breathtaking backdrop! Cala Llenya is a popular family-friendly beach among locals and tourists. A crescent of gently-sloping white sand and crystal clear water, framed by pine trees and rocky cliffs. There is only one chiringuito that serves lunch, so make sure to bring some snacks and drinks for the little ones. Located on the upcoming east side of the island, Cala Nova is surrounded by gorgeous scenery. It usually has shallow waters, even if sometimes on a windy day it can become a decent spot for surfing – making it the perfect place for young surfers to learn. Children can safely play on the long beach while mums and dads can relax in the sun and enjoy a delicious lunch in one of the trendy beach restaurants of Cala Nova. Try the famous Atzaro Beach restaurant for some delicious seafood or the new Aiyanna Beach Club with its bohemian relaxed vibe and delicious healthy meals. Near Ibiza Town, there is the beach of S’Estanyol, a tiny, private cove surrounded by rocky cliffs. The entire bay has a new trendy feeling thanks to its beach restaurant, Cala Bonita. This little slice of paradise is one of the last few quiet beaches where locals and visitors can enjoy some peace and quiet, also during the busy summer season. Talamanca is the closest beach to Ibiza town. A white stretch of sand in a beautiful bay, lined with a wide variety of restaurants and bars on its palm tree promenade. The beach has always had a very relaxed vibe but lately has a jet set twist due to the opening of prime luxury establishments. Las Salinas is possibly one of Ibiza’s famous beaches. It’s a long stretch of soft sand, surrounded by a nature reserve park, sand dunes and pine forests. The sea is particularly clear and salty, with easy access for children. In high-season it gets very busy and unless you are up for some fun-crazy Ibiza beach time, we will advise to avoid it or arrive there late afternoon when is quieter. Off-season is a great place to enjoy some quality beach time with your family. Along the beach mums and dads can enjoy lunch in one of Ibiza’s famous beach bars and restaurants. Cala Gració is a sheltered cove with incredible turquoise waters, so no wonder that is one of the beautiful little beaches in the north of San Antonio! It’s an ideal quiet beach for families, even in high season. Thanks for being a deep cove it does not have any waves or currents, making it a perfect safe place for the little ones. The water is shallow, warm, and so clear that you can see the bottom— perfect for swimming and diving. Cala Tarida is another great family beach, on the west coast. This beach ticks all the boxes, big seashore where kids can have fun out of the water, crystal clear shallow water and plenty of kid-friendly activities. Surrounded by bars and glamour beach clubs, deciding where to eat will have never been so easy. What else could you wish for to have on a relaxed beach day in Ibiza? Cala Vadella is a beautiful bay with all the amenities for an ideal day at the beach. This beach has always been a family’s favourite and it’s easy to understand why – soft white sand that slopes gently into shallow waters, plenty of bars, restaurants & ice cream shop – perfect for an afternoon treat! The beach offers plenty of space for having fun with the kids and the crystal clear water is perfect for swimming and snorkelling – there is also a dive school in the area. The enchanting bay of S’estanyol has always been one of Ibiza’s coolest and not-so-well-known spots. There is just a single beach restaurant there and it’s been a favourite amongst locals for private parties and skinny dips for years. The restaurant has just been taken over by a new team, headed up by Australian TV celebrity chef Karen Martini. She has a string of awards and credits to her name from ‘down under’ and the menu at Cala Bonita looks great with the focus on Mediterranean flavours using local organic produce. We haven’t eaten here ourselves yet but we will be driving down S’estanyol’s bumpy track very soon. The reports are of mouth watering food at eye watering prices. Service levels tbc. Opening a restaurant next to a main road can be a recipe for disaster but perhaps not so in Ibiza. Can Bass opened up in June at km7 on the Ibiza /San Jose road. With the help of a fair few containers of teak furniture from Bali , a good effort has been made at making some intimate areas creating a nice atmosphere. It’s a surprisingly big place. When we ate here the menu was interesting but not complicated. It has a Spanish Mediterranean theme with a lot of variety. The food was decent, the service willing and the prices surprisingly good (year one strategy perhaps). Some kid friendly options on the menu too. It’s probably not worth driving across the island to, but if you are in this area for dinner then we thoroughly recommend it. It might be the next km5. Best of luck to the Basque owners. 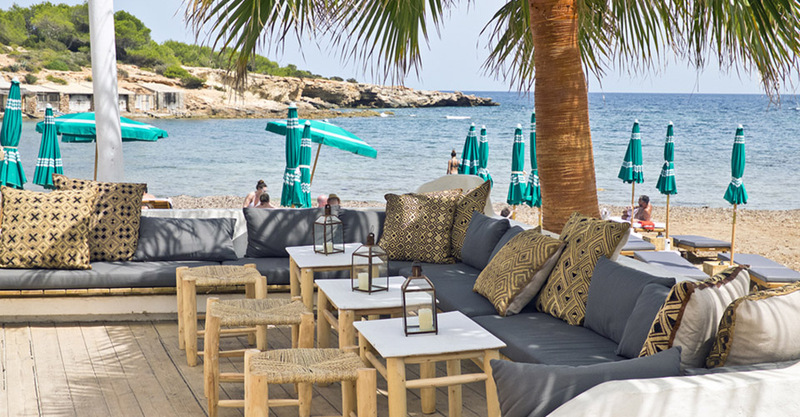 On the back of the success of IT in Marina Botafoch (a fantastic modern Italian restaurant which we love ) , IT have taken over the beach club at Cala Moli. It’s the only restaurant in this pretty west coast bay and it even has a swimming pool. So, the fundamental ingredients were there for something special and it was only a matter of time before someone grabbed one of the last great beach club opportunities on the island. The new owners have done a great job and the place oozes style. We haven’t eaten there yet but if the food is on a par with it’s Marina Botafoch sister it will complete a very special location on the island. Yet another brand extension. 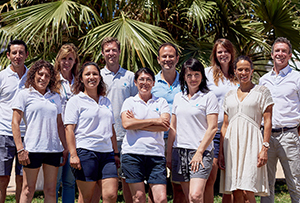 This time from the owners of the Cotton Beach Club / Fay sushi restaurant in Cala Tarida . This is a different offering. More of a cafe restaurant. It is a great place for breakfast but it doesn’t sit alongside it’s west coast partner in quality for lunch or dinner. Stunning sea views but in somewhat ordinary surroundings. Figueretes is up and coming but still needs to come up a fair bit to support high restaurant prices. But with a new 5 star hotel opening set for 2017 around the corner and the possible redevelopment of the paseo maritimo (board walk) maybe they have seen the light before anyone else. Let’s see. For our full island restaurant guide just click here. Enjoy the rustic chic lifestyle in Ibiza this summer. We still have a (very small) handful of weeks available in some beautiful ibicencan country houses. They are all wonderfully ‘campo cool’ and only a few minutes from beautiful bays and beaches. We hope to see you out here enjoying your blissful island break soon. Like us on Facebook to follow the latest news from the island or visit our website. Copyright © 2015 Mi Casa Tu Casa All rights reserved. High up on the hillside from Villa Sky are stunning views of Formentera, home to crystal clear waters and beautiful beaches. The perfect location to relax and breathe in the fresh sea air, taking in the views of the vast ocean before you. Can Cantó, just a short distance away from Santa Gertudis, is an outstanding 4 bed finca recently reformed by renowned local architect Rolf Blakstad. Can Cantó is exclusively managed by Mi Casa Tu Casa, you won’t find this villa anywhere else. Click now to check availability. When you think of a holiday to Ibiza you might instantly think of the beach, but located in the center of the island lies the stunning village of Santa Gertrudis, with its laidback bohemian vibe. A delightfully family friendly surprise.